Yesterday, after the long and protracted relegation saga, Charleroi were relegated to the 2nd tier of Belgian football after 26 years amongst the elite clubs. It was a bleak day in the history of the club. Several top Belgian players have plied their trade at Charleroi, notably Enzo Scifo, Philippe Albert whilst Daniel Van Buyten and Everton’s Marouane Fellaini both came through Charleroi’s youth system. But memories of past glories and European qualfication have well and truly been eradicated this season. Everything that could have gone wrong this season did go wrong. If you were to compare this campaign to that of an English side, it would have to be Newcastle United 08/09. With the obvious comparisons of playing in the same colours, and having expectations that outstrip the actual quality of the side, there’s another glaring similarity to Newcastle. A megalomaniac chairman. Abbas Bayat certainly courts controversy. The Iranian businessman took over the club in the middle of the last decade, and has instigated a slow decline ever since. Since Jacky Mathijssen left in 2007, the club has had 10 different managers including Scots John Collins and Tommy Craig, as well as former Hearts manager Csaba Laszlo who given the chop right at the end of this year. The maximum tenure being one full season if you’re lucky. Just this season alone, Charleroi have had 5 different bosses – a ridiculous number. Even more ridiculous when you find out Charleroi changed boss after losing one playoff game. Still, to balance, Eupen sacked their boss and brought back Danny Ost, which proved to be a good move. The season started terribly for Les Carolos. A win against Eupen on Matchday 2 was their only one in the Jupiler Pro League until February, making them a nailed on candidate for the relegation playoffs. Off the field, Bayat sacked his nephew Mogi, who was general manager at the club. Seemingly not face-to-face according to some reports. With only one win to their name, Bayat scoured the European free agent market for players, adding 11 new players in January. According to my possibly inaccurate calculations, Charleroi have used around 40 players during the season, taking squad rotation to levels that only Rafa Benitez knows. Only one newcomer has proved to be a great signing – Dudu Biton from Israeli club Hapoel Petah Tikva, who’s scored 5 goals in his 11 games at the club. That’s around 25% of the squad’s entire goals all season, possibly suggesting why Charleroi are at rock bottom.But from February onwards, Charleroi put up a little fight, picking up the odd win against fellow strugglers. But all in vain in the end. Now, as many of you know who follow me on Twitter, I don’t like the Playoff system in Belgium. Actually it’s pretty complex and stupid, considering the fact that Standard Liege can win the league after a dire regular season being 16 points off the pace. Last night’s game was equally enthralling. Eupen went two up thanks to Macedonian Marko Obradovic’s brace minutes after coming on. The second was a fantastic looping long-ranger, which caused a Charleroi season-ticket holder to run onto the field, and the rest duly followed. The Charleroi ultras began to throw missiles onto the field and play was stopped. Not the first time that the fans have got into hot water, after the Walloon derby incident where tennis balls were thrown onto the pitch. Hooligans rioted outside with police, who deployed the water cannons. While their actions are wrong, you can understand the frustration of the faithful. A sad day for Charleroi. But who’s to blame? If you were to ask former manager Jacky Mathijssen, it’s entirely down to the chairman. If you were to ask the fans – it’s entirely down to the chairman. Charleroi 10/11 – a dummy’s guide for how not to run a football club. They’ll be back, but will it take the chairman to step down for that to occur? The future is bright, the future is Belgium. Apparently. To start off – I hate using that phrase. Golden Generation. Synonymous with English national failure with the FA/English media using it to describe the crop of the last decade when they clearly achieved nothing other than mediocrity. The only real country that deserve to be described as truly having a generation of talented players is of course the World Cup holders Spain, with graduates of La Masia finally fulfilling the promises bestowed upon them. 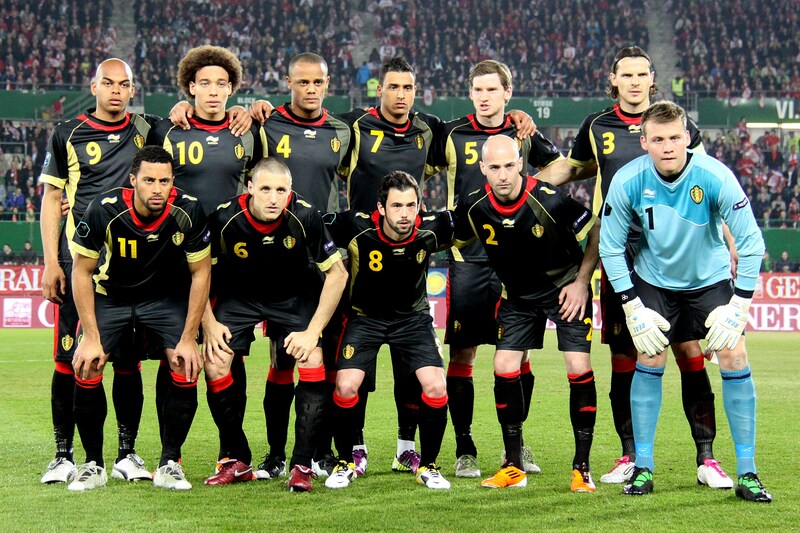 It is with great trepidation that I write this article proclaiming Belgium to be the nation with a golden generation. You’ve probably heard of several of their team, with names flooding the transfer gossip pages of every reputable rag (and some less reputable). The usual ‘most-wanted’ suspects of Romelu Lukaku, Eden Hazard, Steven Defour and Axel Witsel all seem destined for bigger things in the near future. Combine that with a solid core of Premier League talent in Vincent Kompany, Thomas Vermaelen and Marouane Fellaini (although the last two are injured at the moment) and highly rated Ajax pair Jan Vertonghen and Toby Alderweireld (again injured, you’ll note a theme here) you have the basis of a decent side. Time is on Belgium’s side too. Of the current squad, only Daniel Van Buyten and Timmy Simons seem set to retire before 2016. The youth policies installed at many Jupiler Pro League sides in the last decade seem to be finally reaping the dividends with several scouts flocking to watch Belgium’s game in Vienna against Austria. It was a crucial game in Group A of Euro 2012 qualifying, with Belgium needing to win to have any realistic chance of making the play-offs (the group is Germany’s to lose). Manager Georges Leekens sprung a surprise opting to leave Ligue Un’s best player Eden Hazard on the bench, saying pre-match that he felt Hazard’s lack of height in the centre would unbalance the side. Technically, this seemed a sound defensive reason; after all Austria have a freakishly tall team even with 6’8′ Stefan Maierhofer on the bench, and hadn’t lost at home in qualifying since 2008. It takes some guts to drop your country’s most creative player and could have spelt the end for Leekens had his side been beaten. His solution was to use the Standard Liege duo of Steven Defour and Axel Witsel as the lifeblood of the team. Both know each other inside out, and without becoming too cliche, Witsel is half as good without Defour alongside him. Think of a much-low grade version of Xavi-Iniesta, with a bit more grit. Despite missing targetman Romelu Lukaku and goalkeeper Silvio Proto, Belgium started brightly and grabbed an early goal through Witsel capitalising on a deflected cross to head home. The front-four were electric: Twente’s Nacer Chadli and Fulham’s Moussa Dembele worked the flanks effectively, giving the Austrian full-backs trouble as they went out wide repeatedly. Genk’s Marvin Ogunjimi’s was a bit passive up front on his own, but this allowed Witsel to assume the ‘Fellaini’ position – basically box-to-box although much more effectively than Fellaini had in previous internationals. Austria came back late in the first-half but Leekens’ tactics were holding them at bay. Controlled possession didn’t let them near the ball and at times you wondered who were the home team. Early in the second half, Witsel picked up his second. A wonderful passing move saw the Red Devils parked in the final third. A sensational cross from Laurent Ciman found Witsel at the back post. Nonchalantly,he chested it down and smashed it home. Not a bad goal to score in-front of Bayern Munich scouts. Previously, Witsel was notorious for breaking Marcin Wasilewski’s leg, but he seems to be letting his skill do the talking and be allowed to concentrate on his game. Belgium then held out until full-time, with Austria rarely troubling debutant keeper Simon Mignolet. The travelling 2,000 Belgians went home in jovial spirits, but certainly weren’t getting carried away. Belgium beat Russia at the end of 2010, only to draw with Finland in the next friendly. That didn’t stop the Belgian press though. One match report headline literally translating as “A winning team is born”. The next game was equally important to create momentum against Berti Vogts’ Azerbaijan side. They had endured a pretty torrid qualifying campaign, bar one standout result by beating Turkey. Leekens again left Hazard on the bench and brought in Genk’s fox-in-the-box Jelle Vossen up top. What followed was another, more-or-less emphatic result. Defour was once again central to everything Belgium did in the game. The most encouraging aspect of the game was the amount of times Belgium tested the Azerbaijan keeper, 25 shots in total. Sure, the opposition wasn’t the most challenging but it’s important to string together results and it has ultimately changed Belgium’s qualifying campaign. Maximum points this month sets up a potential play-off decider against Guus Hiddink’s Turkey in June at the Roi Baudouin. The signs are encouraging: scoring at will, more fluidity than the disjointed play with Hazard and Fellaini present. Leekens definitely has created a conundrum for himself, but with so many young talented players at his disposal, it’s a position many European managers would be envious of. Leekens didn’t left Kevin De Bruyne and Yassine El Ghanassy in the U21’s, both having great seasons domestically. Rule 1 of the Internet: Don't slag off your colleagues. The social networking phenomenon amongst footballers has divided many. Some see it as a chance to talk to their heroes, some prefer to ignore the banal ‘banter’ between the so-called professionals (I’m looking at you, Messrs Ferdinand and Savage). But Rule No.1 of using a social networking platform is not to bring the game into disrepute and undermine any person within football. We’ve seen it recently with former Liverpool player Ryan Babel displaying some shoddy Photoshopping skills, with a picture of referee Howard Webb sporting a Manchester United shirt. Yesterday, albeit funny, Wojciech Szczesny tweeted “Is it a bird? Is it an aeroplane? No, it’s just Ashley throwing Chelsea out of the FA Cup” as Ashley Cole skied a penalty against Everton. Now this is all very minor in comparison to goings-on in Belgium this weekend. Club Brugge keeper Stijn Stijnen has been demoted to the reserves after it was found that he had been posting messages on the unofficial Club Brugge blauzwart forum defaming not only his competition for the No.1 spot, but also the management too. Not exactly the smartest career move. Club Brugge have had a season to forget. Out of the title race quite early on and their best player Ronald Vargas suffering a severe knee injury, Adrie Koster has somehow held onto his job throughout the season when it appeared he would lose it. Brugge enjoyed a renaissance recently, with Ivan Perisic banging in the goals for them but it only takes a bit of scandal for everything to unravel. Former international keeper, Stijnen has been at the Brugge club for more than a decade but has been rotated with Colin Coosemans and veteran Geert De Vlieger this year, with no keeper showing enough to maintain his place in the side. But on the forum, he anonymously questioned the ability of Coosemans claiming he looked uncertain between the sticks, whilst also glorifying himself. Stijnen didn’t stop there though, saying “shame on you Henk and Sven” which most likely referring to Club Brugge’s youth coaches Henk Mariman and Sven Vermant who train 18-year old Coosemans. Just possibly. Strangely, on Club Brugge’s website, there’s a video entitled – Stjin Stijnen – I’m 100% behind Coosemans. Hmmm. Now, unfortunately for Mr Stijnen, it soon became obvious who was behind the smear campaign as Sporza’s Peter Vandenbemptlaan exposed his trolling. A recent statement to Sporza from revealed that it was his brother and his girlfriend who had been behind the forum posts. Whether this is merely a cover-up, we are yet to know. So, moral of the story kids, if you want to remain at a top Belgian club, don’t masquerade onto internet forums to defame those challenging your spot. It’s just not a good idea. He would have got away with it too if hadn’t been for those pesky meddling fans. Or hadn’t done it all. On a serious note, this does expose Club Brugge’s inner policies and an apparent disharmony. This weekend they faced Lokeren and won, but the interesting point was that as well as Stijnen, Wilfried Dalmat (brother of Stephane) was fined for comments against manager Adrie Koster, despite his recent impressive form. All in all, one of Belgian’s premier clubs looks a mess after these revelations. Koster’s role at the club seems almost untenable, and it will be interesting to see what Stijnen has to say once he inevitably leaves. This attitude was best illustrated in 1999 when the two nations shared a manic 5-5 draw. The defining moment falling to Patrick Kluivert, who had the goal at his mercy, but goaded the Belgian defence to tackle him as he tapped it in. But surprisingly their two biggest clubs, having shared almost 60 domestic championships between them, had never met in European competition until last year’s Europa League group stage. But 12 months on, the last 32 draw put these two greats together to tussle once again. You could argue it was a draw neither wanted, both incredibly respectful of each before the tie. Mohamed Moallim is your guide for AFC Ajax, whilst I’ll do my best to outline the dangermen of RSC Anderlecht. It promises to be a free-flowing fest of football and the match of the round. Well for us two anyway. Let’s get the obvious candidate out of the way. Les Mauves’ prized asset and wonderkid Romelu Lukaku normally leads the line in a 4-3-3 formation. He’s been linked to just about every European juggernaut there has been, since bagging 20 goals in his first full season at Anderlecht, at just 16. I’m fairly certain you will have heard the comparison to Didier Drogba as well, in terms of the teenager’s immense strength and power for his age. It is a truly phenomenal thing to see; George Leekens has already used him (fairly unsuccessfully so far) as the figurehead of a fluid team and his influence is huge. Take last weekend for example: Anderlecht chose to rest Lukaku for the game against Cercle Brugge. Even against ten men they struggled to break down the ultra-defensive Cercle. Jacobs put him on (replacing Tom De Sutter) in the second half to try get his team that vital goal, which they did in the 90th minute. The breakthrough came from inspirational winger Mbark Boussoufa. The Morroccan narrowly edged out Lukaku to win his second Belgian shoe. He is key to their system, creating on the wing then cutting inside and switching positions with Jonathan Legear which causes havoc. Of course this game will be probably more important to him than anyone, having learnt his trade through the Ajax youth-system. As high as mark of class as any. Others players to look out for include recent Argentinian call-up Lucas Biglia, who orchestrates the midfield with wonderful passes – a very similar player to Andrea Pirlo, complete with Loreal hair. He’s aided well by Guillaume Gillet, a very flexible midfielder. The goalkeeper, Silvio Proto broke a club record this weekend, having now gone 840 minutes without conceding in the league. Once accused of being erratic with his tendancy to rush towards any attacker, he now has cemented his place as Belgian’s No. 1. It may seem harsh, and possibly ludicrious to some, to criticise a defence that have conceded just 14 times in the league this season. But when put up against much tougher opponents, Zenit St. Petersburg for example, the usually rock solid defence tend to crumble in awe of their opponents. The centre-back pairing of Hungarian Roland Juhasz and Czech Ondřej Mazuch have been almost everpresent for Les Mauves, forming a great understanding. But you have to feel they will be tested severely by Ajax’s forwards. Mazuch is only 21, and has little experience at this level so could be the prime man to target. Right-back, Marcin Wasilewski has fought back from a career-threatening double leg-break and you’d expect with someone who had suffered such a bad injury, they would lose a yard of pace at least. ‘Wasil’ scored against Zulte Waregem in December and immediately ran to the away fans and thumped his badge with honour. A tremendous servant to the club, but having hit 30 and with said previous injuries, he could be the weak link. Another huge problem with Anderlecht is their lack of strength in depth. Bar the obvious suspects, you wouldn’t expect any of the benched players, other than midfielder Kanu or US international Sacha Klještan to make an impact in any shape or form. Strikers Matias Suarez, Tom De Sutter and newly signed Dalibor Veselinovic are simply not good enough for this level. Without Boussoufa and Lukaku, they look incredibly average. 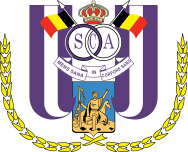 Anderlecht are currently in the midst of 15-game undefeated streak, which stretches back to the end of October. Right before that they were humbled 5-1 by bitter rivals Standard Liege, which seemed to give Jacobs’ team a wake-up call and they’ve not looked back. They currently sit three points clear of Genk at the top of the Jupiler Pro League and have yet to concede in 2011. Just the right kind of form to bring into European competition. The veteran manager began his coaching career in the Belgian FA, managing various youth teams and nurturing new talent in arguably Belgium’s most exciting era in the late 1980’s into the 1990’s. He then became assistant to Wilfried Van Moer and current coach, George Leekens’ first tenure. He made the step-up to club management in 1998, managing RWD. His first trophy was with now extinct club La Louviere in 2003, when he won the Belgian Cup. This was a fantastic achievement and Jacobs was (and still is) known for that nurturing of talent, giving Peter Odemwingie his break in Europe for example. Eventually he wound up at Anderlecht as assistant coach to Franky Vercauteren (strangely enough his rival for the title this year, since he’s at Genk). This seemed an appointment in waiting, and Vercauteren left in November 2007. Jacobs had to wait until last year to taste championship success, ending the dominance of Standard Liege for the time being at least. His policy of integrating youth players into the side has reaped dividends on the pitch and certainly off it too, with an astronomical fee for Lukaku expected in the next transfer window. Historically, Ajax’s strengths have been its attacking play. This still applies today, even though they are a far cry from some of their glorious sides of the past, they still play to attack. With Luis Suárez departing in late January for Liverpool, it diminished somewhat – the Uruguayan was responsible for 35 out of Ajax’s impressive tally of 106 goals in the league last season – if you also add what else he brings, it’s a massive loss if an adequate replacement isn’t found soon. Although, Suárez hardly featured in Frank de Boer’s XI, due to a domestic ban he was serving prior to his move. De Boer’s arrival after Martin Jol’s departure in early December brought a feel good factor back to the club. On the pitch he reverted Ajax back to their traditional 4-3-3, and more emphasis on wing-play and having an able playmaker playing off a number 9. The goals haven’t flown in at an incredible rate but he has somewhat rekindled some players, who have already shown more than they did in the first half of the season. If attack is the teams strength, then defence/defending is the weakness. In saying that Ajax doesn’t have a bad defence theoretically (on paper) Gregory van der Wiel is one of the brightest young right fullback around, Jan Vertonghen has been Ajax’s most consistent player and a all round talent and Toby Alderweireld has come on strong. What lets them down is the concentration level, if one nods off then chaos ensues. The left-full back position has been a worry, especially as Urby Emanuelson has left – even though it’s not really his best position De Boer would rather trust him than say Anita. Right now it’s held by Daley Blind, despite the immense talent he posses, I’m of the mind that it’s too not his best role. Another weakness stems from the strength, the tempo, De Boer in the system he wants to play, requires quick movement. So far the play has been languid which tends to mean any build-up or counterattack is broken down. It’s still early days in his tenure, but this is one area he would like to correct immediately. With Suarez gone, Ajax has to look for other players to emerge from the shadows and take a great degree of responsibility. There are some candidates, and good ones. Siem de Jong whose been a mainstay in the team for the past year has emerged as De Boer’s number 9 of choice, despite being a natural midfield he’s taken to the role of playing the false #9 – he keeps the ball moving, holds it well and allows team mates involved in the play and he has the knack of finding the goal. Another player is the rejuvenated Miralem Sulejmani, often played as a left-forward under Jol. It looked like he would be surplus to requirement last summer, but a possible loan move to West Ham broke down but its under De Boer that he is showing glimpses of the player that Ajax broke the bank for – playing as a right-forward, Sulejmani has everything to succeed, his dribbling is a strong suit and so is his finishing, taking on a fullback is no problem and so is crossing. 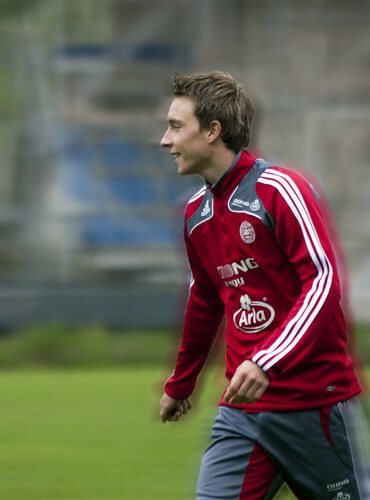 He has become the face of De Boer’s tenure so far, he or Christian Eriksen. The 19-year-old Danish sensation was a bit-part player under Jol (which is fair enough) but he’s now a crucial component in the makeup of the team. As a trequartista, Eriksen pulls the strings – though he’s not known to be a proven goal scorer, it’s his vision, passing and playmaking abilities that excite De Boer more than anything, and as soon as he took charge he highlighted Eriksen as the one who could take Ajax back to the top. A player mature for his age, he has spoken of his desire to stay at the club to develop instead of moving elsewhere, and there are a plenty of suitors. As a season overall, it’s not been the best. What started as a promise faded as Jol’s tactics became stale and players frustrated. De Boer revitalised but a 3-0 defeat away to FC Utrecht derailed any comeback for the league, they’ve since gone on to record wins but a recent 2-2 draw at Roda means the side are 5 points behind the joint leaders PSV and FC Twente. 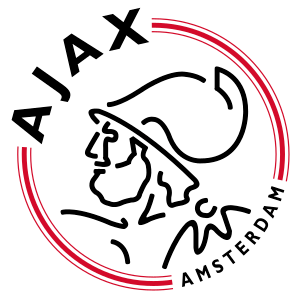 Of course that lead can be cut down but with games running out Ajax’s priority could mean qualifying for the Champions League for next season becomes the major goal. One of Ajax’s greatest players, Frank de Boer played under Louis van Gaal in Ajax’s great side of the mid 90’s with a degree of success. That greately inspired his footballing vision and how he wants Ajax to play. This role is his first major one and becomes only a select few to have managed the side after previously playing for the club with distinction, before the role his major position was Bert van Marwijk assistant with the Dutch national team that got to the World Cup final. At the same time he worked at De Toekomst, Ajax’s fabled youth academy, and it’s this education and expertise of the future talents that might have gotten him the job – the cynic in me see’s a couple of first team players leaving in the summer. If Ajax decide to invest by bringing through some of the young talents then who better to coach them. Already the likes of Jody Lukoki, Lorenzo Ebecilio and Araz Özbiliz (albeit he played one game under Jol, after being pressured into playing with wingers) have made their debuts and featured under him. 3/4/10 – the biggest moment in Vanden Borre’s career. You’re probably thinking; hang on, he was at Portsmouth then, a side bound for relegation. Well yes, he was. This was a dull 0-0 draw, livened up for avid Gillette Soccer Saturday viewers as Chris Kamara’s inexplicably missed Vanden Borre’s dismissal from the game, in a comedic or unprofessional manner, depending on how you view Sky’s comedy vehicle. In fairness to Kammy, most people have missed Vanden Borre’s career since he left Anderlecht in 2007. If Football Manager were an indication of how Vanden Borre’s should have developed, then he’d certainly be at a top club by now as Mr Utility Man (he’s definitely better than John O’Shea). But as we all know, a football management simulator is not a good judgement of potential, as much as we claim it to be. Vanden Borre is a true product of the Anderlecht youth-system having joined them as an 8 year old. He made his senior debut around the same time as Vincent Kompany did but their careers are seemingly poles apart now. Whilst Kompany’s reputation as a tough tackling centre-back is reaching near world-class proportions, Vanden Borre’s career stagnated. The early signs were promising for Vanden Borre as he made his debut in March 2004. Operating normally at right-back (yet capable of playing right midfield, defensive midfield or even centre-back), Vanden Borre would roam right along the flank, daring opponents to face up to him but the pace of the teenager would leave many far behind. He showed great versatility whenever he was called upon in his rookie years, filling in for other players adeptly. A month later a shock international call-up against Turkey. To put that in perspective, he had played 5 senior games for Anderlecht and it also made him the second youngest Belgian international of all-time, at 16 years and 187 days. He ended 2003/04 with his first league medal with the club. Vanden Borre quickly established himself as one of Anderlecht’s key players – sticking at right back most of the time, pacey with a powerful shot. Several European clubs circled (notably Inter Milan and Ajax) but he favoured first-team action and development in Belgium. The huge pressure placed upon him took its toll in the next few years. After all when Paul Van Himst refers to you as one of the best talents he’s ever seen, it’s fairly insurmountable pressure. Several niggling injuries saw Anderlecht bring in Marcin Wasilewski in 2007, who quickly usurped him at right-back. Vanden Borre also had personal problems at the time, with his mother falling serious ill in the early months of 2007. His good friend Kompany still backed him to succeed, even saying “He remains the greatest talent on Anderlecht. The club must adapt themselves a bit also to him. He plays the best on his position on the middle field. In his position he can become the best player from the history of the Belgium football.” High praise, unfortunately never fulfilled as in the summer of 2007, Vanden Borre headed to Serie A to join Fiorentina who paid around 4 million euros for his services. Things in Florence couldn’t have started any worse for Vanden Borre as his mother passed away in September 2007; a traumatic event for anyone to deal with, even harder when you’re only 20. 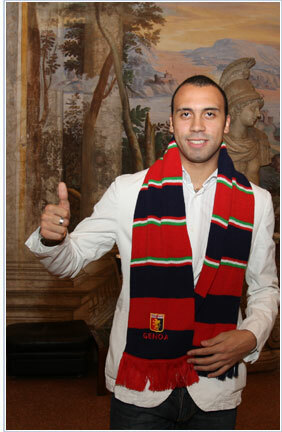 He only made 2 appearances for Viola before joining Genoa on loan (as they were co-owners, with Papa Waigo going the other way). He was unlucky at Fiorentina, in my opinion, as he was unable to get a game with a incredibly strong defence featuring Per Koldrup and Tomáš Ujfaluši for example. The short drive north to Genoa in January was an attempt to prove his worth to Fiorentina, but it never really got going there either, failing to impress Italians with his apparent eagerness to get forward and distinct lack of positioning. Vanden Borre couldn’t adapt to the more defensive game in Italy, although not helped by his lack of consistency. Last season saw him join doomed club Portsmouth. Paul Hart who signed him, said: “Now’s the time for him to come up with the goods. We’re looking forward to being a part of that.” Once again, Vanden Borre failed to live up to the billing although you could argue the chances of succeeding at Portsmouth last year were nigh on impossible given the club’s financial woes, which translated onto the pitch. He made 19 appearances in a threadbare squad, and at least showed some fight albeit in vain. Genoa severed their ties with Vanden Borre in the summer, leaving him to join Belgian club Genk, hence why this piece has been written. Unavailable to play until this January (after playing for 2 clubs in 2010), Vanden Borre has been training and playing reserve games biding his time. But on Saturday, he should hopefully make his debut for the team against Kortrijk. Genk have been performing far and above expectations this year with their young squad. Currently 2nd in the league and 6 points off Anderlecht (with a game in-hand), they’ll certainly be there or thereabouts come playoff time. It’s a big game for them, with Anderlecht vs Standard Liege the day after, they could claim back some ground with a Liege win. But will Vanden Borre’s presence unbalance the side? Early signs suggest no. For one, their manager Frankie Vercauteren coached Vanden Borre at Anderlecht. Secondly, he’s good friends with some of the squad and gives the team a further option in their back four, with Vanden Borre bombing on forward for the defence of Joao Carlos, Torben Joneleit and Eric Matoukou. He’s certainly a useful addition to the Genk team, along with Liverpool loanee Chris Mavinga. Media reports suggest he’s already become a leader in the dressing room too. You have to feel this move could be Last Chance Saloon for Vanden Borre. He’s been given his opportunity abroad, failed to seize it and returned to the league that made him such a talent. Still only 23 and shaped by tragedies in the last few years, Vanden Borre has to grasp this chance, if he is ever to live up to those early claims of becoming a Belgian superstar. Maybe he might be the catalyst that sees Genk win the league title, above the club that made him.